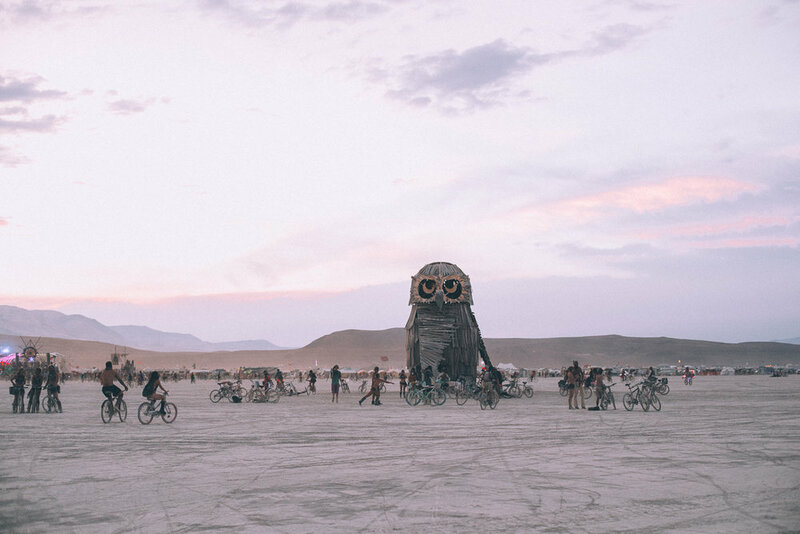 Burning man: it’s Hogwarts for hedonists, located in a hellish alkaline dust bowl that is clearly trying to kill you. After spending 7 days there, from Sunday to Sunday, I can confirm that despite the horrible environment it’s absolutely the most magical man-made place on earth. But is it really a “place”? Seeing that it exists for mere days before disappearing off the map, it barely seems real. An event spun from dreams and cocktails and LED lights and tantric chakra crystal healing cacao ceremonies. With a pinch of polyamory and whole heaping of megalithic interactive art thrown in for good measure. 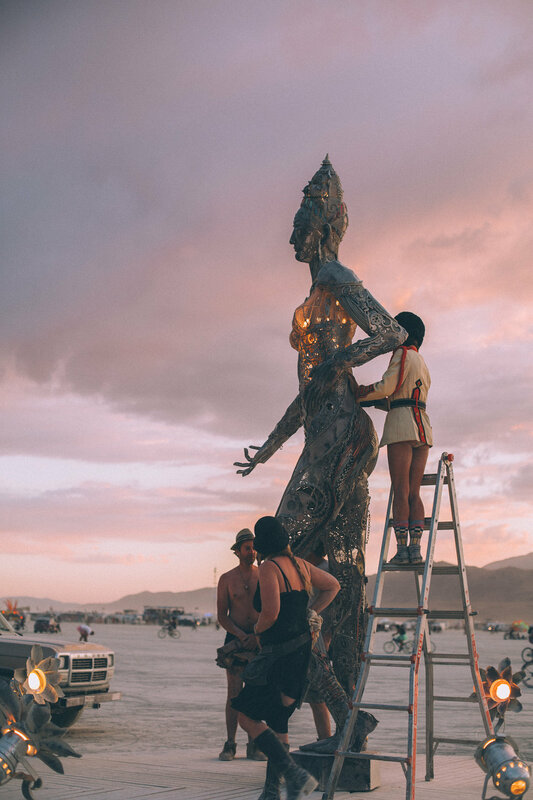 I went to Burning Man this year with an artist crew to help with the instillation of an art piece called The Messenger (pictured above). I didn’t actually install or break down, but I helped with cooking meals and taking photos. Thanks to the crew I tagged along with, survival was no problem. We had an insulation dome with a swamp A/C that kept us relatively dust-free and cool in the blistering heat. 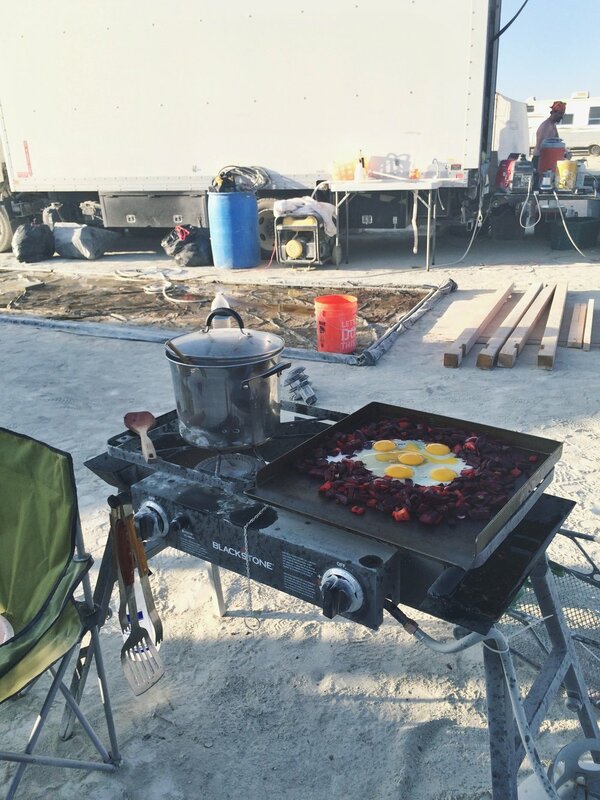 We had a kitchen tent with a wood and insulation framed cooler that kept our food fresh all week (thanks to daily rotations of ice and dry ice). We had centralized water access and grey-water removal (because we got adopted into a larger camp). And a pretty solid (albeit imperfect) shade structure. As long as I drank enough water, got enough sleep and ate snacks throughout each day I was healthy and happy. But what did you eat?! 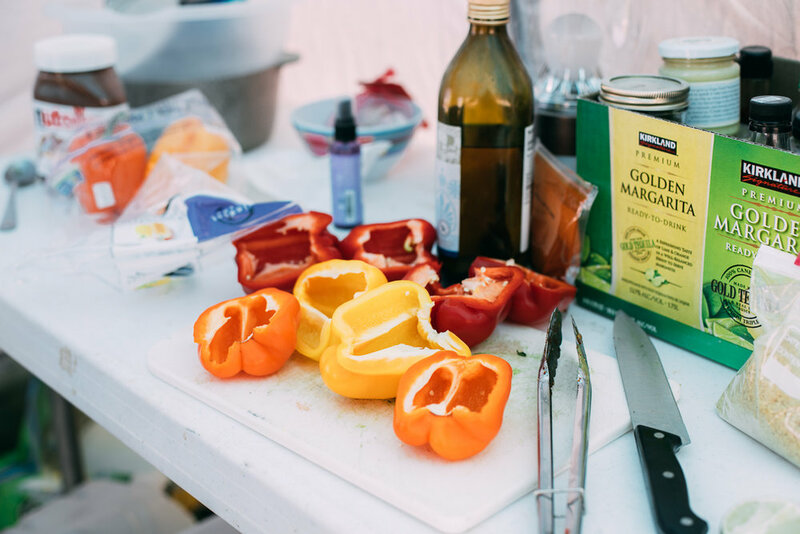 My kitchen partner, Erin, and I went way above and beyond what was necessary for the trip regarding food. We planned one meal a day for the crew, plus snacks and a daily drink. We packed twice as much food as we needed (too many melons!). She brought a whole kit of herbal medicine goodies. And I even pre-made a vegan golden milk mix (just add water!). We had a pretty badass meal schedule planned out, and just so many snacks. 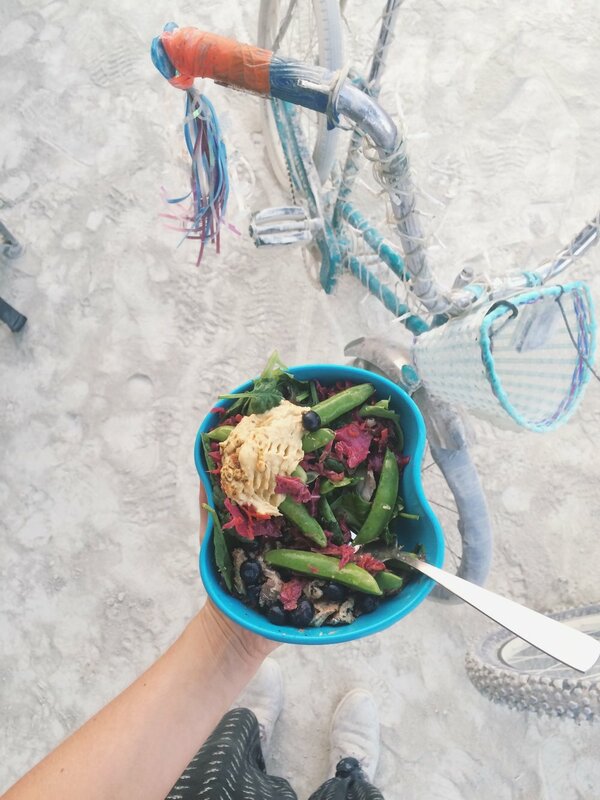 Ultimately we ended up scrapping most of our original plan in order to use up the vegetables, fruits and proteins that needed eating immediately (fresh food goes bad really quickly in the desert environment). 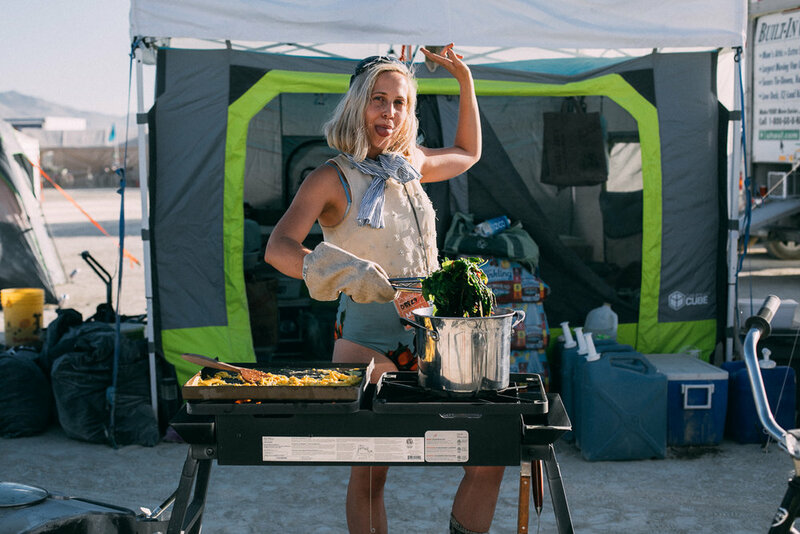 After this burn and acknowledging that you simply don’t eat as much out on the Playa, I would do a lot differently next time. I think 1 meal a day is a great idea to feed a small crew, but variety is not as important as ease of cooking. And it’s simply not going to be possible to get everyone together for a meal everyday. So cooking a meal that can be stowed away for folks to pick over in their own time is best. 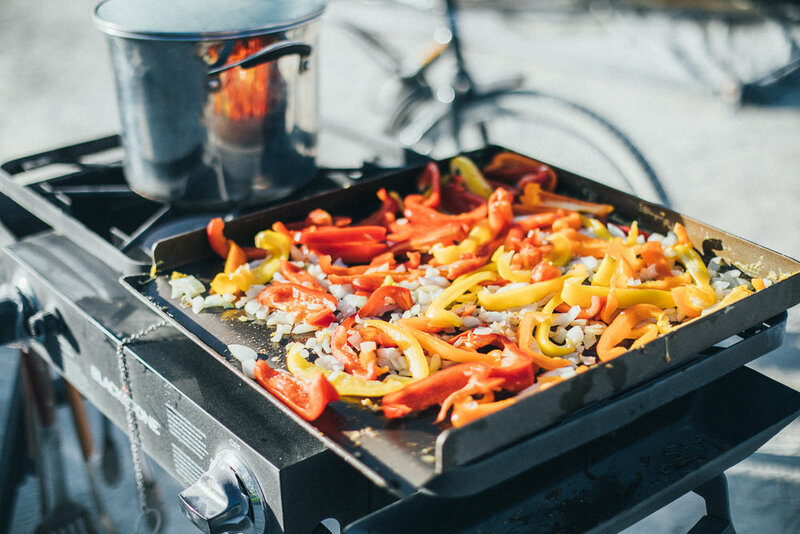 I think in the future I would focus on quick-cooking grains combined with easily sautéed vegetables, like beets, peppers, sweet potatoes, onions and greens. We ate a variation on that most evenings, using different spice blends to change up the flavors. Ethiopian berbere or Japanese curry were my favorites. 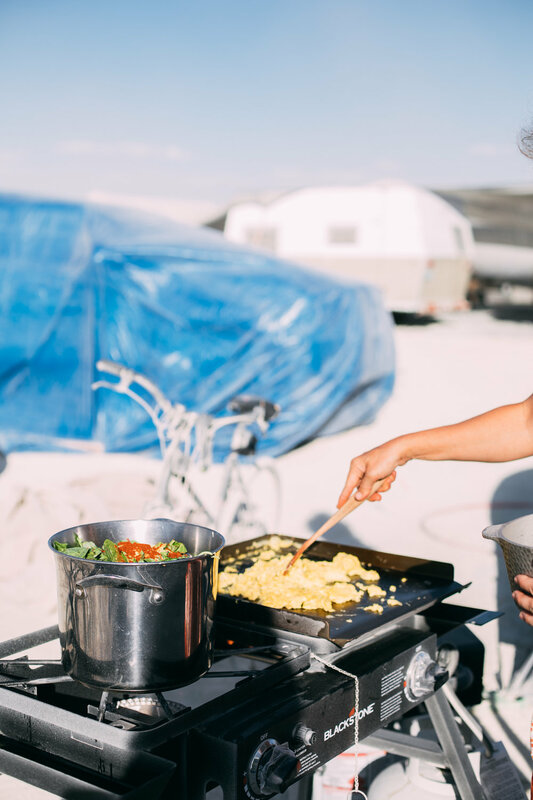 Scrambled and fried eggs were a welcome protein, especially because our eggs were fresh from a farm and didn’t need to be refrigerated. We did big salads the first 2-3 days. And breakfast burritos with eggs, avocado, greens and homemade sauerkraut were a pretty frequent anytime meal. Pour myself some lukewarm cold brew coffee, and stir in a tablespoon or 3 of coconut milk powder. If lucky, add a few cubes of ice. 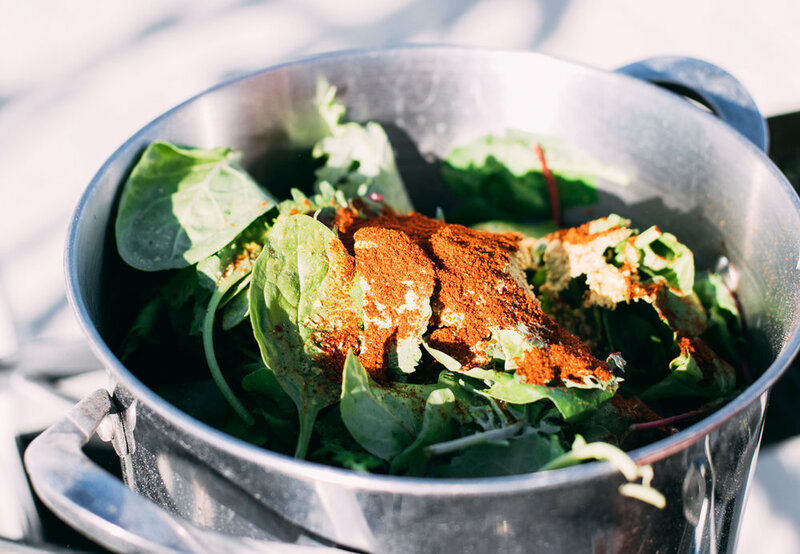 Eat an entire avocado wrapped in a nori sheet like a burrito, with loads of hot sauce. Eat a few more sheets of nori. 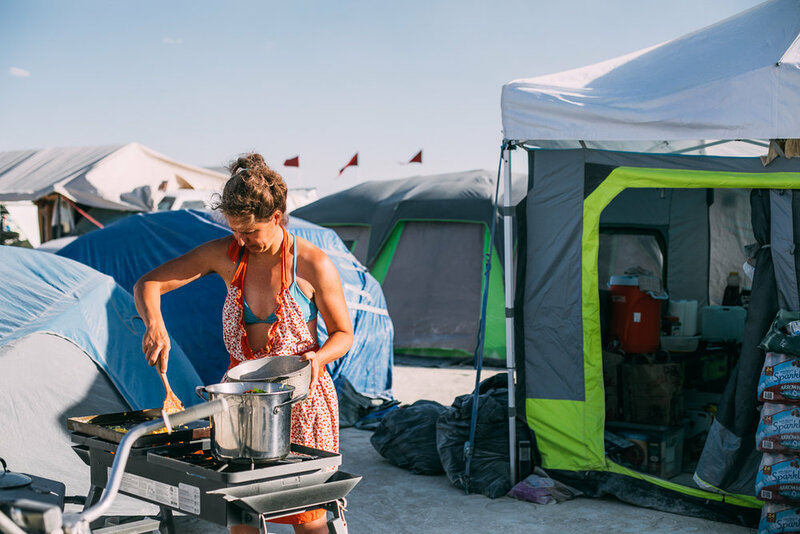 Sweat beneath the comfort of our shade structure, whilst rifling through the tiny book of big events (the Burning Man event guide). Sip constantly on water mixed with electrolyte powder (I love this one, although it tastes like sunscreen, but I actually kind of like that about it). Eat a salmon jerky and curse my past self for only bringing 5 of them. Cover my whole life in sunscreen, set my goggles on my head and tie a bandana around my neck (aka my makeshift dust mask for the less-dusty days). Go for a long bike ride in search of pineapple flavored snow cones and/or vegan coconut ice cream (and find both daily, hallelujah). 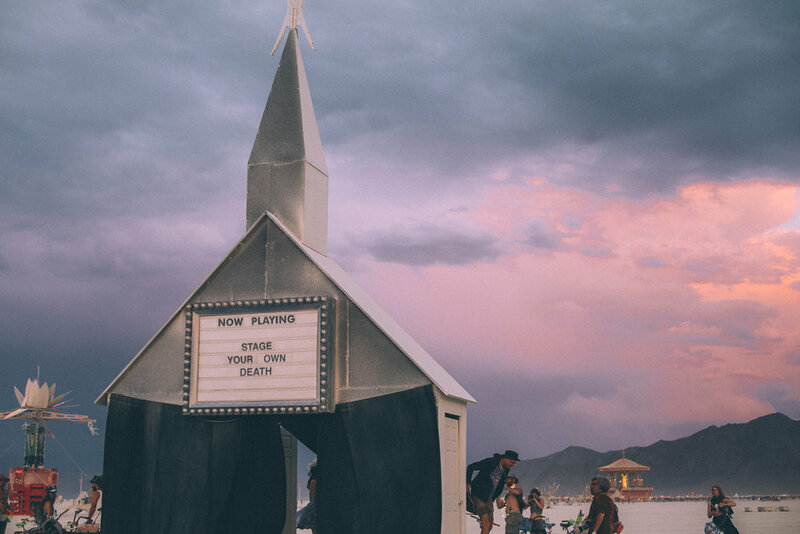 Drink a honey- and cayenne-infused cacao drink and dance for two hours with a group of 50 people on a dance floor in the god-forsaken desert — wherein I experience deep spiritual healing and silently cry for about twenty minutes as the dance ends. Get stuck in a dust storm and help an event tent hold a flyaway pole down by throwing my whole weight into it until the storm settles. Come back to base camp and take a nap in the moon dome (our silver insulation dome with a swamp cooler). Wake up around 5 to make dinner for the crew with my campmate Erin (we shared food duties). Cook quinoa and a giant mess of collards / spinach with berbere and coconut oil. Sautee onions and beets. Scramble some eggs. Erin might cook up some sausages for the meat eaters (*ahem* everyone but me). Dinner is served! 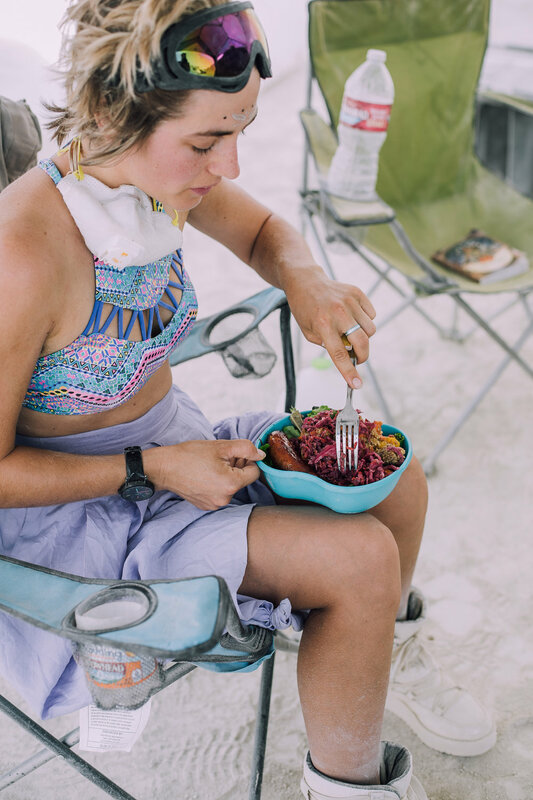 I got into eating sardines packed in olive oil with my meals, with lots of Erin’s homemade sauerkraut and fire cider. I frequently added half an avocado to my bowls as well. Head over to The Messenger Shrine to tend the flame in the statue’s heart (someone had to be present to make sure the fire element was safe, so the crew rotated shifts every night from 6pm - 2am). 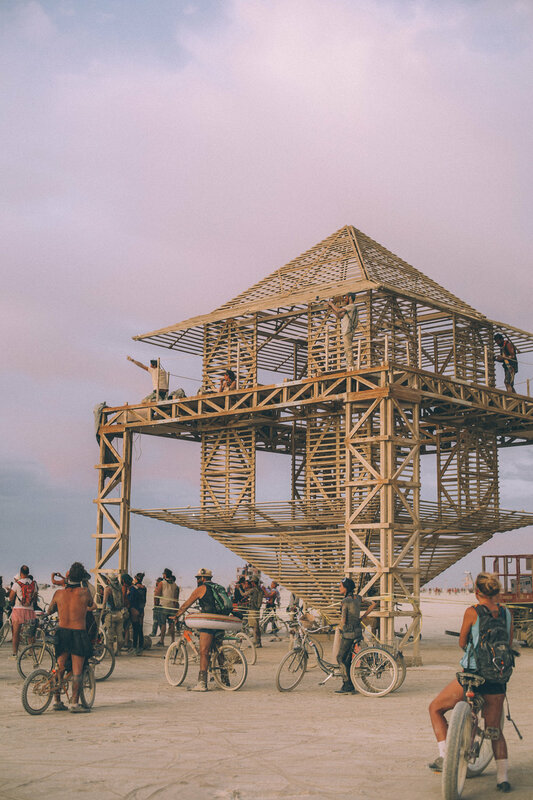 Gather the crew together for a bike ride into the sunset to explore the Playa’s magical interactive art and dance parties. Drink craft cocktails at a velvet lounge with live jazz music. 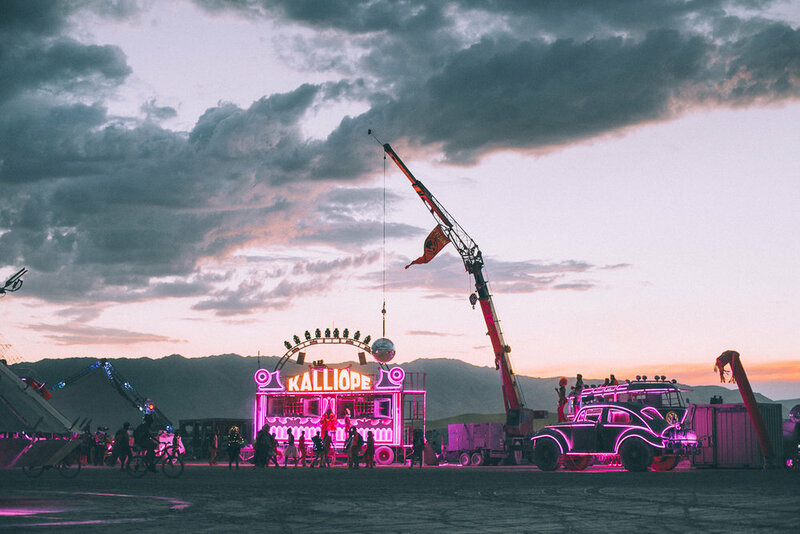 Bike thirty minutes out to open Playa and grab a pink martini at a bar bedazzled with pink lights, served by smiling bartenders wearing (you guessed it)… pink. Jump on a gravity propelled whirl-a-gig swing. Smoke a damiana and rose cigarette whilst floating on a two ton cement block that’s suspended five feet off the ground via some precise mechanism I don’t quite understand. Pin a letter of forgiveness and letting go on a wall of the Temple (they burn the structure on Sunday). Slowly walk around the Burning Man temple (he had his own temple this year). Observe the art pieces surrounding the Man. 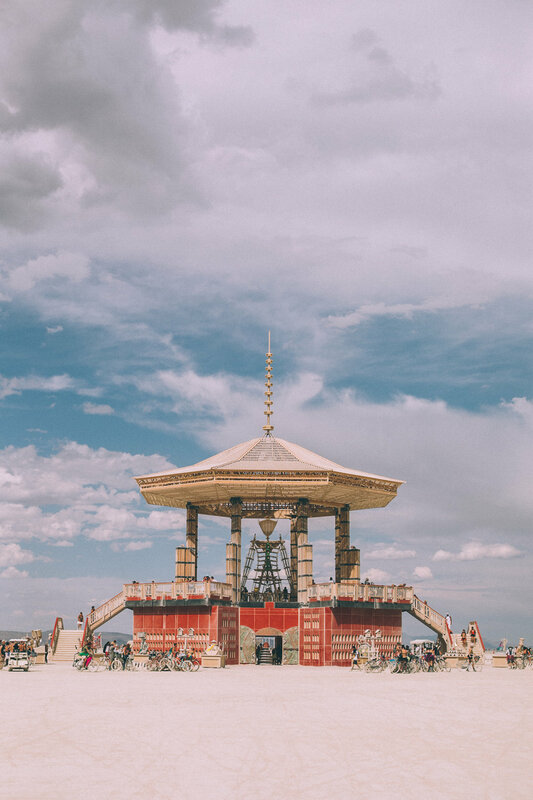 Listen to the boisterous happy chatter of the crowd, the clicking of bike gears, the soft thrumming of chimes in the temple. Dance until sunrise at the LED tree (designed with individually luminescent leaves that glimmered with a sort of dappled light and could be programmed to pulse and shift colors following the beat of a DJ). Bike back to camp as the sun rises and fall asleep. I mean, that’s a lot of my week packed into one day. I can’t possibly explain the full experience. I’m going to have to do that annoying thing and say you had to be there! Also I realize that my little story makes it sound like I was drinking a lot every night. I actually only had about 3 servings of alcohol the whole time! Alcohol is not really my intoxicant of choice, clearly. I chose not to drink much mostly because I was concerned I wouldn’t be able to recover from how dehydrating alcohol is, and dehydration is something I struggle with even in normal life. Basically I was a water sipping queen, y’all. I was planning on being snap-happy with my camera the whole time. Mostly because I was nervous. I wanted to have my camera to hide behind. And I wanted to have a “purpose,” a work-related reason to be there. 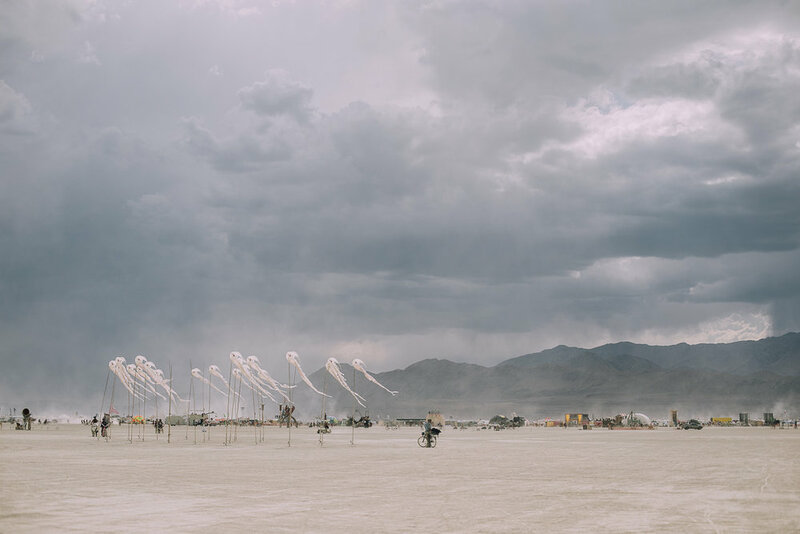 I even submitted a proposal to Burning Man to get permission to bring a camera (totally pointless, by the way, seeing that there’s no way to control the images coming out of the event). After just one day, I realized that I needed to be totally present and put the camera down. In a way, that was a break through for me. I didn’t need to use my camera as a shield. And I certainly didn’t need a project to distract me from the experience. There’s something rather invasive about taking photos at Burning Man, what with so many people barely clothed (or not clothed at all). And there’s a “culture of consent” that encourages asking to take photos of people. I love that! But I admit I am not extroverted enough to run around trying to take pictures of strangers for the sheer joy of chatting. I was already taking in a lot of stimulus, so I held back and mostly took photos of landscapes and my friends. It’s more my jam to observe in a journalistic style anyway. I think next time I’ll be more accustomed to the madness, so I’ll feel more free taking photos. I might even offer portraits as a gift! I think that would be really special.